PennyFabricArt! Here’s what the Judges had to say: Judge 1: Beautiful! I have no problem with the use of orphan blocks. I kind of look at them as a separate piece of fabric in your stash. And I’m a big fan of taking them and using them in a quilt instead of keeping them in a drawer. I love the movement you’ve created with the triangle block and placement of the blue and green variations. Judge 2: The triangle shapes are so interesting visually, and I really like the colors and the black and white middle blocks. Note: I don’t have a problem with using orphan blocks, especially when so many quilters have UFOs that they’d like to finish. Judge 3: I see absolutely no problem with orphan blocks. 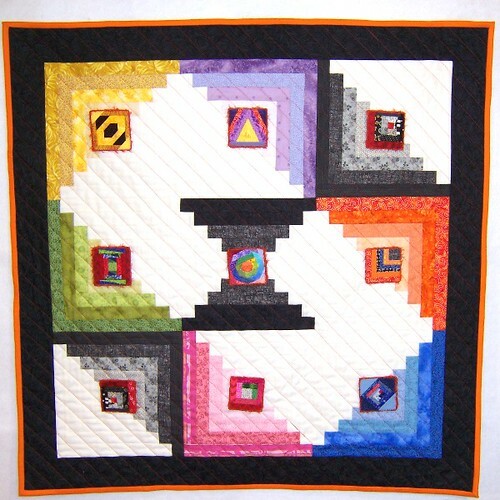 In fact, I think that is part of what Project Quilting is all about! Low cost, great end product and using something up along the way. Great idea. When I first looked at this piece I missed the “Snail Trail” setting. I love the use of the diamond block instead of the ordinary square log cabin. I also love that you actual drafted this yourself. I would love to see this piece in person. Great job. And I won’t keep you in suspense much longer – the Judges winner, with an average score of 9.33 goes to…. LoveBugStudios! Here’s what the Judges thought: Judge 1: Lovely little pins. I think this collection would have been fine on its own, but the base quilt for display makes it so much better. Judge 2: Fabulous! The pins are adorable, and what a great way to “store” them. 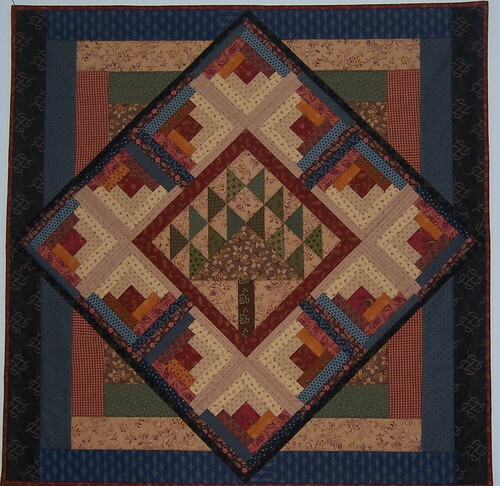 Judge 3: This quilt is my pick of the contest! I love the colors, the embellishments, the extra blocks and everything about it. Your use of yarn on the edges of the tiny blocks is great. Nice job. 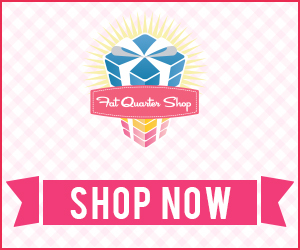 I will be mailing LoveBug her very own copy of Judy Martin’s Log Cabin Quilt Book AND a $10 gift certificate from the FatQuarterShop! Congratulations to all the winners and to all that participated in the log cabin challenge. Once again – amazing entries done by all! If you want to participate in the next challenge – it’s POSTED! Check out ‘Stars Over America’ and don’t forget – It’s Time to Think Outside the Square! Congrats to all the winners!! Beautiful entries. Congratulations to all the top finishers! Amazing work! 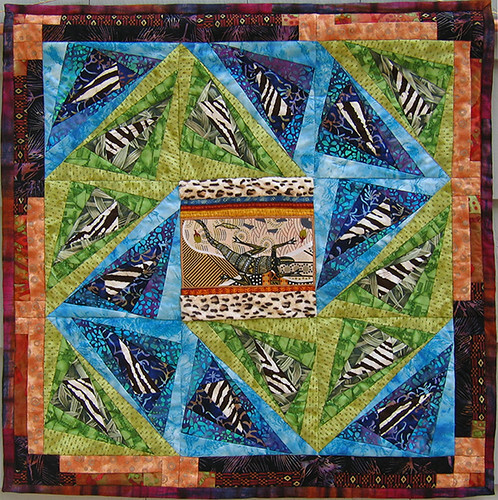 Congrats Lovebug, Penny, and Springwater, beautiful quilts!